Team a turbocharged 4-cylinder engine with an 8-speed automatic transmission, boost the pair with an electric assist off-idle and the creation appears to be a winner for the redesigned 2018 Jeep Wrangler Unlimited Sahara 4X4. Piloting the new one on a very busy weekend, it seemed to me it will run away from the Jeep’s traditional Pentastar V-6 in straightaway, lower-end acceleration, and out on the highway the new retuned suspension is noticeably smoother and more comfortable than before. The 2.0-liter turbo eTorque earns a 22 in-city and 24 on-highway fuel-mileage estimate from its 268 horsepower and 295 lb.-ft. of torque, compared with 18/23 mpg for the 3.6-liter V-6’s engine rating of 285 horsepower and 260 torque. Yeh, but how about offroad? I tried that, too, and could detect no softening of Jeep’s tough-guy image. The Sahara’s SelecTrac four-wheel-drive capabilities are intact, with 10-inch ground clearance, Dana heavy-duty rear axle, anti-spin differential and hill-descent control. The Unlimited four-door is on a wheelbase of 118.4 inches, 188.4 inches in overall length and 4,380 pounds in curb weight. Cargo space behind the second-row seats is 31.7 cubic feet. The Sahara is equipped with a Sunrider soft top, which can be manually removed for open-air driving. As it slid back in its tracks, it brought back memories of some uneasy moments several years ago with a Jeep Liberty Sky Slider roof (let’s forget about that). The Sunrider appears to be well-designed and structurally sound. The Jeep was in my possession from Friday noon to Monday noon, and we made the most of the shorter-than-normal review time. After a relatively short drive Friday evening to the Eaton Country Club for dinner with Bud Hargis and Ila Dubois, on Saturday we drove the Wrangler in to Bruz Beers in north Denver for a birthday celebration for Jackie Chmelka. During the party, planned by Jackie’s sister Laura Jordan Grush, I enjoyed a visit with Roger Jordan, Jackie’s father, regarding a special car he owned years back, the stainless steel DeLorean sports car with gullwing doors. Entertaining the partygoers was Kurt Wells with his voice and guitar. 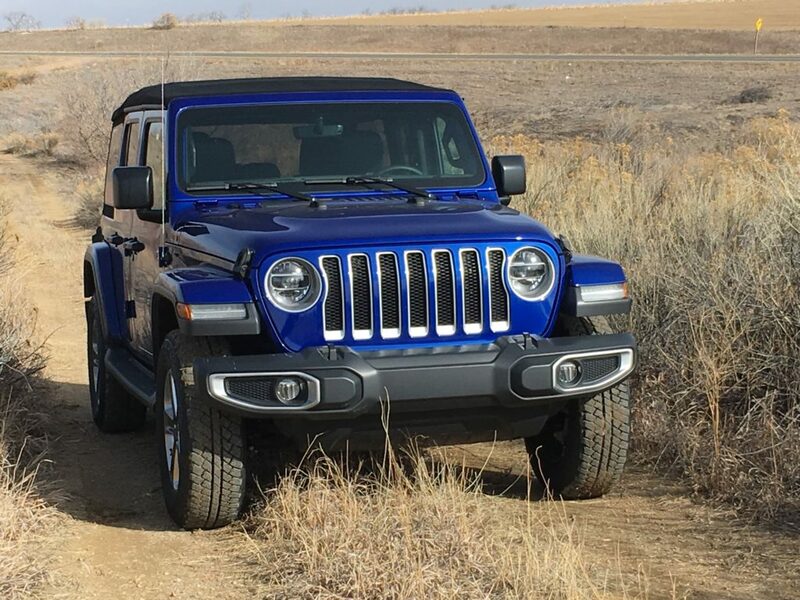 The best test for the big four-door Wrangler came Sunday morning, when Jan and I headed to Carr up north in Weld County a short distance from the Wyoming line; the town is on narrow paved Road 126 halfway between U.S. 85 and I-25, and lends itself to offroad opportunities. Carr often is referred to as a “ghost town,” though on Sunday morning we found it somewhat typical of other small settlements. 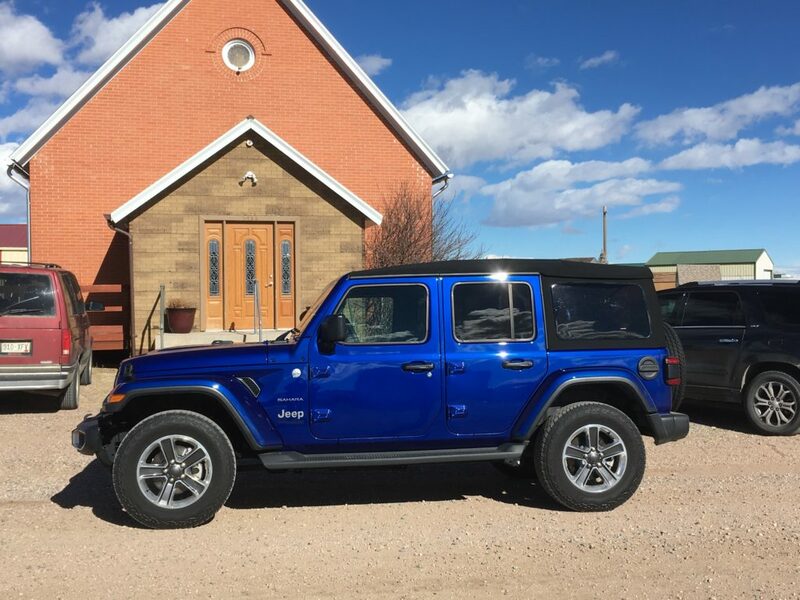 After visiting with Bruce Ransier and Christine Schneider, who have lived in Carr for 12 years, we drove the Jeep past the Carr Community Church; 16 cars were parked around the building, and inside, pastor Philip Lukens was delivering a weekly sermon. As we headed the Jeep out of Carr, back toward U.S. 85, we passed the U.S. post office. This is no ghost town. I’d not driven a $50-grand Wrangler until this one, which peaks out at $50,050. A Wrangler four-door Rubicon a year-and-a-half ago came close at $48,750. From its base of $38,295, the 2018 Unlimited Sahara reached $50k with the addition of the turbo engine for an extra $1,000, the 8-speed transmission for $2,000, plus leather seats, navigation, Alpine premium audio, the SelecTrac four-wheel-drive system, the soft top and LED reflector headlamps. The new Jeep is the JL series, succeeding the Unlimited JK, which began production in 2006.